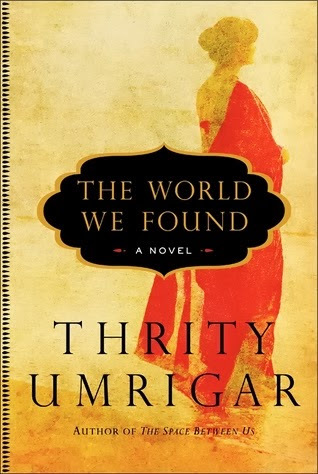 To say I'm disappointed in this latest novel from Thrity Umrigar would be an exaggeration, but in no way was I as engrossed in this story as I have been with her previous work. The World We Found centers around four women who were friends in university. Years later, only two of them are still close. Yet, when called on by one, all respond. Of the four women, Armaiti, Nishta, Laleh and Kavita, I found Kavita the most interesting and Armaiti the least. In college, the women were revolutionaries, but as adults, they're far removed from those optimistic, carefree, world-changing days. As each woman prepares to be reunited with her friends, the reader is given a glimpse into their present-day lives. Nishta's circumstances changed the most, from an outgoing and outspoken college student to a quiet and obedient wife to a husband who had also changed drastically from his college days. Laleh used her family's money as a college student to address any and all problems and that didn't change as an adult. Armaiti, though the focal point of the story and the reason why the women were reuniting, was an extremely uninteresting character. Kavita was most interesting to me because, in her, Umrigar presents a character unlike others I've read about from this area. Her lifestyle is not one that's readily talked about in that region, so it was nice to see that subject tackled. Overall, I didn't feel a connection with any of the women, so it made listening to the book a task, rather than something I enjoyed doing.